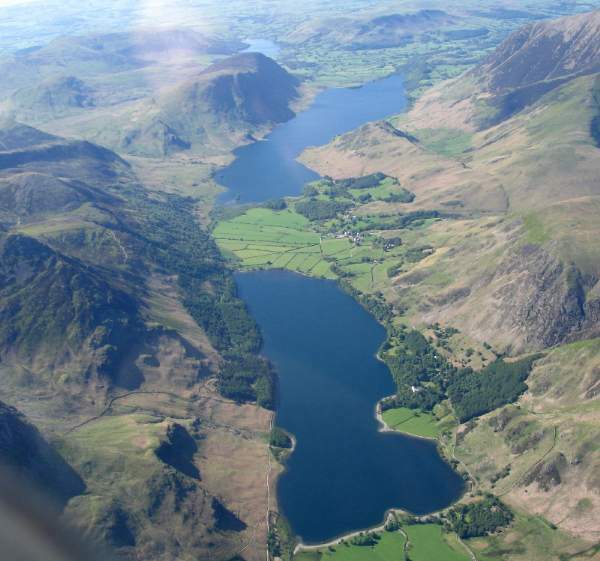 Buttermere – the lake by the dairy pastures – is 1 1/2 miles long, 3/4 of a mile wide and 75 feet deep. The classic combination of lakes and mountains has made this popular with visitors since the beginning of tourism in the Lake District. 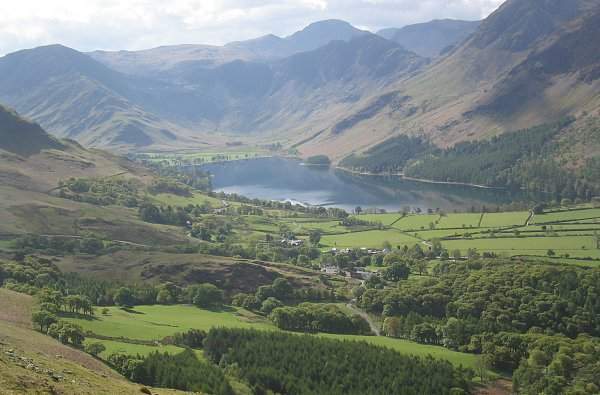 A visit to Buttermere is principally for its natural attractions – as the area offers some of the best walking country in Lakeland. 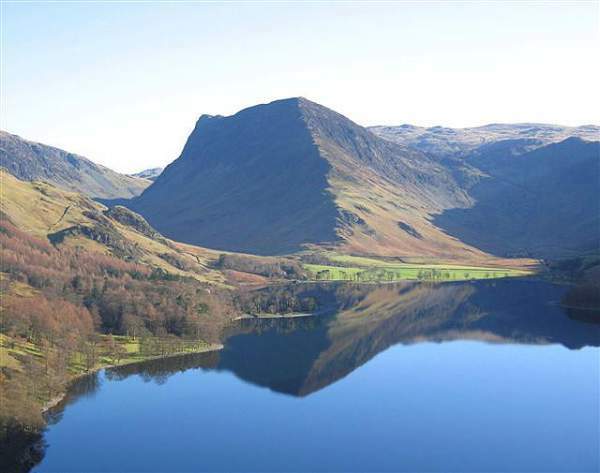 There is a footpath running round the perimeter of the lake, and lovely walks to the summits of Haystacks and Red Pike. Buttermere and Fleetwith Pike. Aerial photo by Simon Ledingham. In the little Church of St James, is a stone tablet set into the windowsill of a south window as a memorial to Alfred Wainwright, the famous walker and author of guidebooks. The window looks out on his favourite place to walk, Haystacks, where at his wish his ashes were scattered. A walk around the lake – by Peter Donaghy. This is a very accessible lake and makes for a pleasant family stroll in 2-3 hours. Set out by going to the left of the Fish Hotel and follow the broad path that leads to the lake. Keep to the lakeside path as it winds its way to the far end. You can usually enjoy some welcome refreshments at the mobile outlet at Dalesgarth Farm. There is a short section on the road before you rejoin the lakeside path, followed by the need to make your way carefully over some rocks. Thereafter the going is easy again with the added adventure of passing through a short tunnel. As you approach the end of the lake, take the higher path at a junction to bring you through Syke Farm and a pleasant indoor opportunity for refreshments and locally made ice cream at the end of your walk. Details of St James’s Church, together with a more ambitious walk through the Rannerdale Valley can be found in ‘Lakeland Church Walks’ by Peter Donaghy and John Laidler.